... Spence and his team looked at total plaque area in 1262 patients attending a vascular prevention clinic. "Spence found regular consumption of egg yolks is about two-thirds as bad as smoking when it comes to increased build-up of carotid plaque, a risk factor for stroke and heart attack." So, both smoking and eating eggs was associated with increased plaque. Smoking was worse, but eating three or more eggs a week came close. "In diabetics, an egg a day increases coronary risk by two to five-fold," said Spence. * Egg yolks are high in cholesterol. Says Spence: "The yolk of a large egg provides more than the 210 mg. of cholesterol in a Hardee's Monster Thickburger, which contains two-thirds of a pound of beef, three slices of cheese and four strips of bacon." In a Harvard prospective cohort eggs as protein source were not linked to cardiovascular disease whereas red and processed meat were. This particular study by Spence et al. was a cross sectional, ie. weak in showing any causality. - The Harvard study was in women only, who enjoy the protective benefit of their hormones, prior to menopause at least. The present study was in men and women. - Women in the Harvard study were healthy, "no known cancer, diabetes mellitus, angina, myocardial infarction, stroke, or other cardiovascular disease." Participants in this study were "patients attending vascular prevention clinics." - The population in this study was older than that of the Harvard study, a mean age of 61.5 years. I don't think it's wise to generalize the findings from a younger, healthier, all-female population to an older, less-healthful population of mixed-gender. 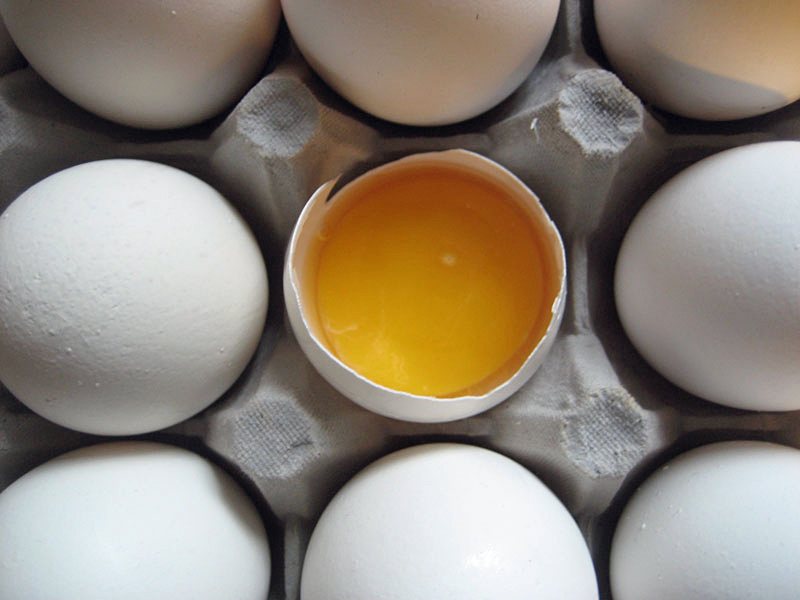 Eggs yolks may indeed worsen their arterial health. There seems to be a lot of anger about this study. It isn't even a windfall, just a drop in the sea of knowledge. But the comments I've seen ... many are acerbic. I don't understand the emotion. I was just on a site called Mark's Daily Apple. It doesn't look like the author, Mark Sisson, has formal medical training. Nonetheless, he is dispensing medical advice. As regards this study, he says everyone should eat eggs, "Oh, yeah – eat egg yolks, and lots of them. Doubly so if you’re low-carb." So, people who have colon cancer, diabetes, hypertension, protein in their urine and kidney disease. People who have had a stroke or heart attack. These are the type of people in this study. He is advising them to eat several egg yolks a day. I avoid eggs because of their high cholesterol. But many people including Dr. Oz extol the health benefits of eggs. Dr. Oz recently tweeted. "If anti-aging is a priority, these are the foods that should be in your shopping cart. http://droz.me/Q3qM1M "
Eggs were in the list. Here is what it said about eggs. "Your favorite breakfast food just got a little bit better! Eggs are rich in iron and biotin, which help keep your skin and hair healthy and full." Dr. Oz recommends eggs? How about that. When I was in school, eggs were a no-no, the yolks at least, for their cholesterol. Later, the American Egg Board came out with their successfully marketed campaign, "The Incredible, Edible Egg." I believed their claim that "There's no reason you can't enjoy them for breakfast every day." A couple years ago I read criticisms of their studies. They based their claims on effects on healthy people, and didn't follow them long enough, a time when ill effects would show up. I also read a lot of literature showing eggs were risky for people with diabetes. Even the Egg Board cited this. Interesting, virginia. What do you eat instead? I've been on sites where people say high cholesterol is good for you. I don't know about all these markers. But plaque can't be good. The anger is because people want to eat their eggs. That and the internet brings out the worst in people. I only eat the egg whites, and it's usually a veggie frittata of some sort. Filling. I truly went through withdrawal, but the drop was significant. So, you still eat eggs. I thought maybe you went for oatmeal. I'm curious what people get together for breakfast when they're working against the clock. I usually grab day-old sweet potatoes. (Not that I don't love them.) Or peanut butter on some fanatic flourless bread. Egg yolks are bad for you if they are cooked and beaten with egg whites, fried in oil, and eaten with fatty bacon. Eaten by itself in its raw original form (without egg whites) is best.